In this section, you will learn how to use Jade template engine in Node.js application using Express.js. Jade is a template engine for Node.js. Jade syntax is easy to learn. It uses whitespace and indentation as a part of the syntax. Install jade into your project using NPM as below. Jade template must be written inside .jade file. And all .jade files must be put inside views folder in the root folder of Node.js application. By default Express.js searches all the views in the views folder under the root folder, which can be set to another folder using views property in express e.g. app.set('views','MyViews'). The following is a simple jade template. The above example will produce following html. Note: Please be careful while giving spaces and indentation in Jade. A small mistake can change the output. Visit jade-lang.com to learn about jade syntax rules in detail. 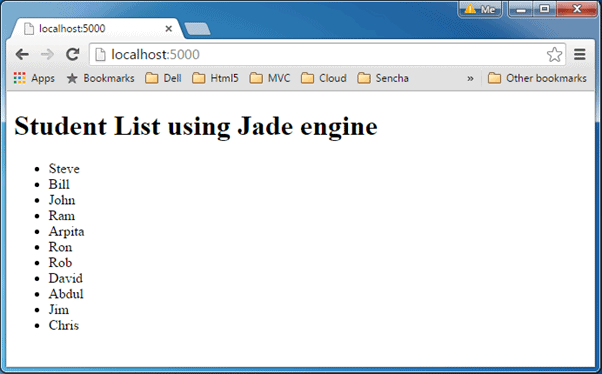 Let's see how to use jade engine with express.js and render HTML. Express.js can be used with any template engine. Here, we will use different Jade templates to create HTML pages dynamically. In order to use Jade with Express.js, create sample.jade file inside views folder and write following Jade template in it. Now, write the following code to render above Jade template using Express.js. As you can see in the above example, first we import express module and then set the view engine using app.set() method. The set() method sets the "view engine", which is one of the application setting property in Express.js. In the HTTP Get request for home page, it renders sample.jade from the views folder using res.render() method. Let's look at a complex example. We learned to access SQL server database in the previous section. So, let's fetch all the students' data from SQL Server and render it using jade template. First of all, create StudentList.jade file inside views folder and write the following template in it. In the above jade template, it uses each loop to generate all the <li> dynamically. Now, render above template in home page request as shown below. In the above example, we pass recordset array as an object to jade template. Jade engine will process HTML template and specified array and render the result. Run the above example using node server.js command and point your browser to http://localhost:5000 and you will get the following result. Visit Jade Language Reference to learn more about Jade syntax.